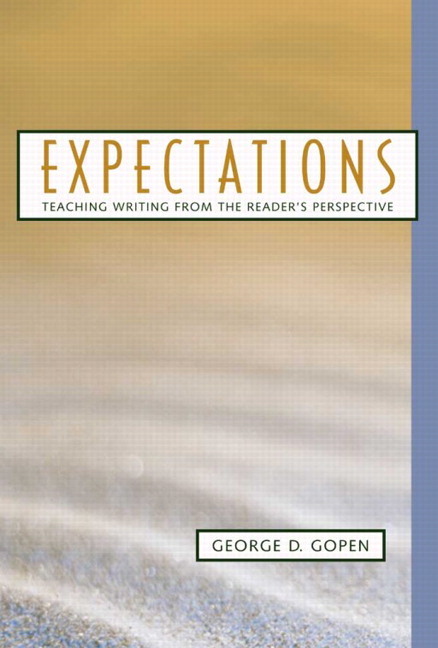 This instructor resource approaches the teaching of writing by focusing on readers' expectations, explaining the perceptive patterns that readers follow in their interpretive process. Examining reader expectations, this text argues that the structural location of a word is often more important than word choice in a reader's interpretation of a piece of writing. Expectations shows how readers gather contextual clues based not on what specific words mean, but on where those words appear in the structure of a sentence or paragraph. It then discusses how to bring these intuitive processes to conscious thought, allowing students to understand and control how readers perceive their writing. Taking a highly pragmatic approach to writing, this methods text values communication over self-expression, which reflects the real world beyond college. An entire chapter on the importance of the beginnings and ends of sentences offers practical solutions to the most prevalent writing problem in professional writing today—the mis-location of crucial information. Thorough exploration of the idea of “linking backwards” and “leaning forward” in sentences helps students gain far greater control over the flow of thought. Analysis of the various shapes of professional paragraphs enables students to produce fluid paragraphs outside the rigid formulas often prescribed by rulebooks. The appropriate use of specific verbs and the notion of action is explored by demonstrating how every verb is potentially weak or strong. An entire chapter on, “Learning and Teaching the Reader Expectation Approach,” helps instructors who are new to the approach avoid the natural pitfalls and avoid the rigidification that leads to unhelpful rule-making (Ch. 7). Two appendices discuss composition teaching methodologies throughout American history. I. A READER EXPECTATION APPROACH TO WRITING. 1. The Problems of Interpretation and the Efficacy of Reader Expectation Theory. A Few Pedagogical Hints Reviewed. 4. Beginnings and Endings: The Topic and Stress Positions. Structure, Substance, Context, and Some Helpful Boxes. 5. Using Topic/Stress to Control Development Within the Paragraph. Style and the Consistency of Choice. Using Topic/Stress to Solve Typical Student Writing Problems. The Multiple Uses of the Stress Position. Topic Changing and Topic Stringing. Exerting Control Over Revision Through Topic Stringing. Seeking Control Over Reader Response. 6. Paragraphs: Issues, Points, and Purposes. Procrustean Problems in Teaching the Paragraph. Point Placement and Paragraph Types. The Writer's Power to Shape and Change Reader Expectations Concerning Paragraph Structure. A Note on Whole Documents. 7. Learning and Teaching the Reader Expectation Approach. Learning to Teach Writing from the Perspective of Reader Expectations. Supplementary Techniques and Related Concerns. The Most Common Student Objections to REA. Where Are the Linguists When We Need Them? The Prague School of Linguistics and Functional Sentence Perspective. Appendix A. A Structural Definition of Rhetoric. Appendix B. A Backwards Look at Error Avoidance. Appendix C. Reader/Listener Expectations from the Past. Appendix D. Bibliography of Works Cited.